Performance Time: Approximately 45 minutes, 48 pgs. DRAMA. Adapted from Stephen Crane’s novel, Maggie, A Girl of the Streets (1896) this play depicts with shocking realism the poverty and desperation of Maggie, a young woman who must work in a sweat shop and endure abuse at the hands of her alcoholic mother. 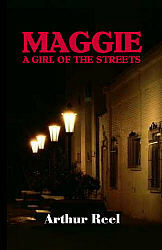 Yearning to escape from the slums, Maggie soon takes up with Pete, an outgoing bartender. Pete takes Maggie to the theatre and to dance halls, where she is dazzled by all the glitz. Soon Pete’s interest in Maggie wanes, and he is seen cavorting around town with his old flame, Nellie. As rumors abound that Maggie has been “ruined” by Pete, Maggie’s brother and mother cast her out of the house and onto the streets.